Thanks to BlogdiPadova and OfficinaArtigiana I had the chance to join the DIGITALmeet called #storieartigiane, which means “artisan stories”. The intent was to visit some Venice artisans workshops, know them, let the owners tell their stories and then narrate them through our pictures and our blog posts. I was thrilled when they ask me to participate because I really love those kind of things. The first stop of our tour was (obviously) precisely the Cannaregio Torrefaction a coffee shop which is part of the historical Venetian places, dating back to 1930 (For who’s interested the shop is open from Monday to Saturday 7 am – 7.30 pm and on Sundays 9.30 am – 1 pm and 2 – 6.30 pm). Every day they toast coffee beans in a teeny tiny space behind the counter. If you want to try their historic blend you have to ask for the Remer one (which means rower). Many people told me that their coffee granita is excellent but it is sold only during Summer. We were welcomed by an employee, Alice, who showed the process of roasting and obtaining coffee from the green beans to the cup. Then we made a quick tasting. And at that point I got myself noticed because the first minuscule sip of coffee I drank went down the wrong way and I started coughing desperately. I had to go out not to disturb and frighten the clients. What a poor figure! . Warning: the shop has closed. Next stop among the Venice artisans was El Papussa (on Google Maps there’s still the old address, you will now found the shop near 1154 Calle del Forno), another tiny shop, full of things… I dare say overloaded. The owner, Denis Dittura, told us that he is actually an electrician but at some point he decided to follow the steps of his father, who still (he’s 85) runs a famous furlane slippers shop near St. Mark’s square. The father’s shop is mentioned in every Venice guidebook. He made slippers for famous actors, politicians, even presidents. After his training Denis (he and his father have the same temper so they obviously don’t get along if they stay too much together) found his own shop where he repairs shoes, soles and heels, creates bags, belts and naturally furlane slippers too. He still uses an old (like 100 years old) Necchi sewing machine. He bought a new electric machine some years ago it wasn’t the same thing, so he made a step back. He told: “This old machine gives to my products a different taste”. I spotted slippers in many different colours. They are handcfarted by him, so each pair is different from the others. They are sold at 35€. That day we were in a hurry but I intend to come back and buy a pair for me. I’m still hesitant between black and burgundy. I will make up my mind! Third stop, L’Isola di Pinocchio, Pinocchio’s Island. This was the most magical places of our tour, hidden inside an old palace, with no sign on the facade. So you must know where to go and what bell to ring. I immediately fell in love with this place and with the “puppeteer”, Roberto Comin, who really reminded me of Geppetto. As soon as we entered the workshop on a XVII century mezzanine floor, the first thing that hit me was the coloured and warm atmosphere, made of quirky and picturesque marionettes, books, tools, sculptures, posters and with an unmistakable background music, that of the french movie Amélie (Le Fabuleux Destin d’Amélie Poulain) which I absolutely love and I watched a hundred times. Roberto told us many things: he was unemployed and he left Venice for tuscany. There he met a puppet artisan who taught him the job. Full of nostalgia for Venice, he came back and started his business. 24 years now, helped by his talented seamstress sister. You should see how beautiful the puppets dresses are, one word: masterpieces. Roberto has a huge catalogue of marionettes, but he also creates custom-made puppets, he even made a Jack Sparrow marionette who has been donated to Johnny Depp by his crew on his birthday. This shop is an absolute fantasy world. Last stop, the Hotel al Mascaron Ridente, welcomed by the peculiar and cultured sociologist and psychologist Ruggero Sicurelli, the owner. The Hotel name means laughing mask and it refers to the mask above the front door. Ruggero told us that in Venice there are something like 280 masks above ancient palaces. Only 3 of them are laughing. Anyway their function is the same: keeping evil creatures away from the house. We visited this hotel as an example of industrial archaeology because it was once a sugar factory, then a wax factory, than a shipyard. Back in 1500 sugar was super precious. The doge used to donate little sugar sachets to his guests (1 sugar sachet was worth 2 gold sachet at that time). Now it is a graceful hotel, a little aside the main tourist routes. They managed to obtain a refined and stylish place, maintaining some ancient parts such as recesses on the walls, wooden beams on the ceiling, rustic stone walls but adding modern furnishing and contemporary artworks. I must say I really like this style. I wish I could stay here at least one night, but I think this is too expensive for me! My only doubt concerns the rooms. They have a ground floor with sitting room and bathroom, plus a mezzanine (reachable by wooden stairs) with a double bed. I think this is certainly romantic and it allows to enjoy a bigger space during the day, but during the night it must be uncomfortable to go up and down the stairs to go to the toilet. Every woman knows precisely what I mean! We ended up the tour with a toast at a near bacaro (typical Venetian tavern), and then I had to rush towards the train station (only 12 minutes away). The day after I would have left for my Umbria blog tour. I hope I’ll have the chance soon to visit other artisan shops in Venice or in other towns. It’s always a pleasure to meet such passionate people, Venice artisans who carry on traditions important for Italy to stay true to “herself” and avoid a bit of globalization. 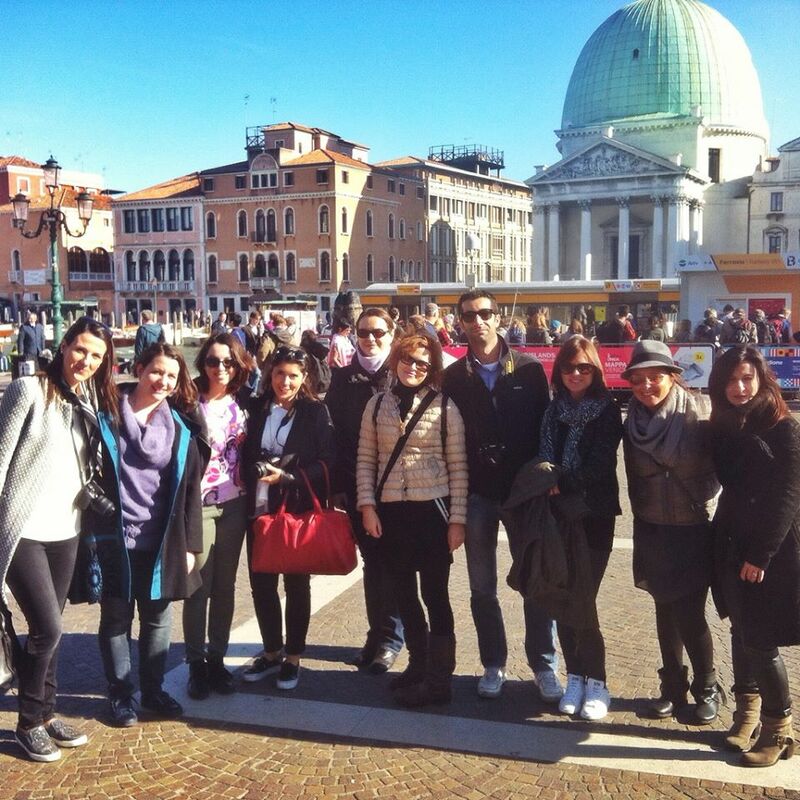 From left to right you can see Cristina Galline Padovane, Lisa del Blog di Padova, Violetta & Giogia FineToDesign, me (in the lilac scarf), Cristina Crinviaggio, Andrea Montagna di viaggi, Elisabetta Italianbark, Elisabetta Officina Artigiana, Silvia Nordest Boulevard. Alberto who runs together with Lisa the BlogdiPadova was taking the picture.